"Laramie Project " & "Laramie Project: Ten Years Later"
The inaugural season of international theater programming by ArtsEmerson: The World on Stage kicks off with the Boston debut of The New York-based Tectonic Theater Project, performing two works: "The Laramie Project" and the World Premiere of "The Laramie Project: Ten Years Later," by Moisés Kaufman, Leigh Fondakowski, Greg Pierotti, Andy Paris and Stephen Belber. Performances of both plays will take place September 24 - October 2 at the Cutler Majestic Theatre, located at 219 Tremont Street in Boston’s Theatre District. To underscore the importance of these premieres, ArtsEmerson has planned two panel discussions to examine the impact of this seminal work. These discussions will feature representatives from the Department of Justice, Tectonic Theater Project, Matthew Shepard Foundation, and other civil rights activists, along with community leaders, including Katherine Patrick, and will take place in the days before the two works are performed at the Cutler Majestic. Panel discussions are open to the public, and will be held in the Bright Family Screening Room at The Paramount Center, 559 Washington Street in Boston. Admission is free, but registration is required. To register, visit the Laramie Residency page at ArtsEmerson.org and click on the “Extras” tab. Tuesday, Sept. 21, 6:30—8 p.m. This discussion will focus on the Shepard/Byrd Hate Crimes Prevention Act, civil rights in Massachusetts and across the country, and "The Laramie Project’s" impact on awareness. Panelists will include: activist Katherine Patrick (daughter of Massachusetts Governor Deval Patrick); Greg Reiner from Tectonic Theater Project; Thomas Howard Jr. of the Matthew Shepard Foundation; Carol Rose of the Massachusetts ACLU; Karen Loewy of Gay & Lesbian Advocates and Defenders; and Matt Nosanchuk, Senior Counselor, Department of Justice Civil Rights Division, a leader in the DOJ’s efforts to educate law enforcement and citizens on the provisions of the Shepard/Byrd Act. Additional panelists will include leaders of the Gay & Lesbian Alliance Against Defamation, Anti-Defamation League, and Human Rights Campaign. More panelists may be announced. Wednesday, Sept. 22, 6:30—8 p.m. This discussion will examine successful tolerance programs in schools and communities, personal success stories of overcoming prejudice and the hot topic of bullying and its prevention. Panelists will include: Pam Garramone of Parents, Families and Friends of Lesbians and Gays (PFLAG); Frank Pantano of the Gay Lesbian and Straight Education Network (GLSEN); David Gammons from the Concord Academy (Gammons directed what may have been the first high school production of "The Laramie Project"); Abe Rybeck from The Theater Offensive; Penelope Larson from The Crossing; bullying prevention expert Bethany Nelson of Emerson College; Greg Reiner from Tectonic Theater Project; and Thomas Howard Jr. of the Matthew Shepard Foundation. The panel will be moderated by Chris Serwacki, advisor of Emerson’s Alliance for Gays Lesbians and Everyone (EAGLE). In addition, ArtsEmerson is planning a series of "Laramie" Dine and Discuss sessions to take place at area restaurants between shows on three dates when both the original and the Epilogue are being performed on the same day. Patrons will have dinner in small groups with prominent civil rights activists and scholars who will facilitate discussions inspired by the plays. Dine and Discuss leaders will be announced in the coming weeks. There is no fee to join a Dine and Discuss session, however participants must have tickets to one of the plays and pay for their own meal. Tables of ten will be reserved for 5:30 p.m. on Sept. 25 and Oct. 2 and at 5 p.m. on Sept.26. Participating restaurants include Max & Dylan’s Kitchen and Bar and BiNA Osteria. Reservations are required, and patrons can fill out the reservation form on the Laramie Residency page at ArtsEmerson.org by clicking on the “Extras” tab. On October 6, 1998, Matthew Shepard was beaten and left to die tied to a fence in the outskirts of Laramie, Wyoming. Matthew’s murder became a watershed historical moment that highlighted many of the fault lines in our culture. A month after the murder, the members of Tectonic Theater Project set out for Laramie and conducted interviews with more than 200 residents. 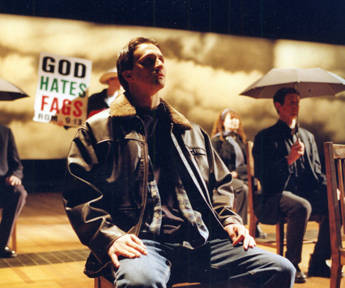 The resulting play, "The Laramie Project," which premiered in 2000, has become one of the most-performed plays in American history, seen by more than 30 million people around the country. It has also been a driving force in the movement to enact the Matthew Shepard and James Byrd, Jr. Hate Crimes Prevention Act, signed into law by President Obama in October 2009. Ten years after Shepard was murdered, the original Tectonic team returned to Laramie to interview the same people and discover how the community has changed politically, socially, religiously and educationally. These new interviews have been crafted into an epilogue to the original. The epilogue revisits people from the original work, but also includes interviews with convicted killers Aaron J. McKinney and Russell Henderson. It also addresses a revisionist narrative that has emerged since the murder –- that Shepard’s death was the result of a robbery gone bad as opposed to a hate crime. On October 12, 2009, the eleventh anniversary of the death of Matthew Shepard, readings of the epilogue were performed simultaneously in 150 cities in 14 countries. In Boston, it was read by Emerson College students joined by members of the community at the Cutler Majestic Theatre. Because "The Laramie Project" has been so important to many high school and college drama departments, ArtsEmerson is inviting those who have been involved in any production of the play to attend the Sept. 24 opening night performance for free. Capacity is limited and free tickets will be distributed on a first come, first served basis. To fill out the RSVP form, visit ArtsEmerson.org and click on "The Laramie Residency" link.